1. The Kakapo is not only the rarest parrot on earth, but also the most extraordinary. 2. This, a little fat bird, never, no, absolutely not, try to use its wings to fly. 3. This parrot is also known as the bird with the longest lifetime in the world. and ptilon "feather". It has so many unusual features that it was initially placed in its own tribe, Strigopini. It has finely blotched yellow-green plumage, a distinct facial disc of sensory, vibrissa-like feathers, a large grey beak, short legs, large feet, and wings and a tail of relatively short length. most of which have been given names. predator-free islands, Codfish (Whenua Hou) and Anchor islands, where they are closely monitored. 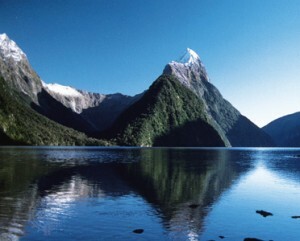 Two large Fiordland islands, Resolution and Secretary, have been the subject of large-scale ecological restoration activities to prepare self-sustaining ecosystems with suitable habitat for the Kakapo. Maori, both for its meat as a food source and for its feathers, which were used to make highly valued pieces of clothing. It was also sometimes kept as a pet. 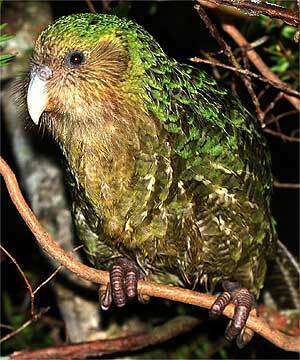 The Kakapo is a large, rotund parrot; the male measures up to 60 cm and weighs from 2 to 4 kg at maturity. flight muscles of other birds. It uses its wings for balance, support, and to break its fall when leaping from trees. Though the Kakapo cannot fly, it is an excellent climber, ascending to the crowns of the tallest trees. It can also "parachute"
- descending by leaping and spreading its wings. In this way it may travel a few metres at an angle of less than 45 degrees. display, or "lek". They choose a mate based on the quality of his display; they are not pursued by the males in any overt way. No pair bond is formed; males and females meet only to mate. search of food. Predators are known to eat the eggs and the embryos inside can also die of cold in the mother's absence. independence, their mothers may feed the chicks sporadically for up to 6 months. it tends to have an adolescence before it starts breeding. Males do not start to boom until about 5 years of age. 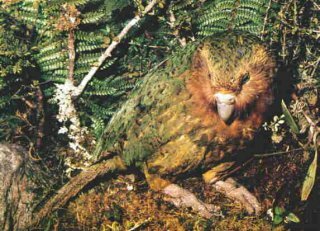 such as those on Codfish Island, Kakapo breeding occurs as infrequently.